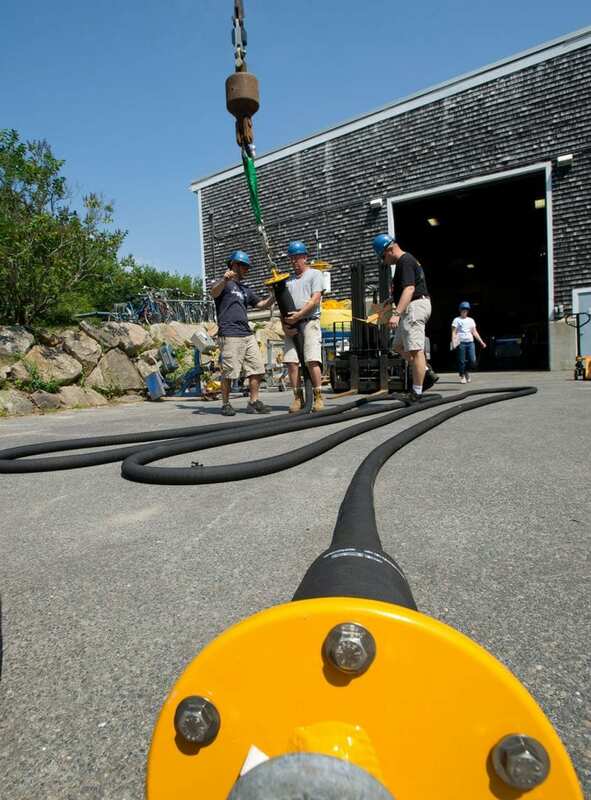 Woods Hole Oceanographic Institution (WHOI) sold its controlling interest in EOM Offshore, a mooring systems company based on technology developed by engineers at WHOI. The company was founded as a start-up in 2010 to commercialize highly stretchable, fatigue-resistant hoses to transmit power and data to and from undersea sensors. EOM’s patented Electromagnetic Stretch Hoses connect surface buoys to undersea mooring lines laden with oceanographic instruments. The hoses are capable of stretching and contracting to accommodate the heave and surge of buoys on the ocean surface that are buffeted by winds and waves. This “stretchability” decreases the wear and tear on the hoses and extends the moorings’ lifespans. The hoses’ ability to absorb extensive motion at the top of the mooring also leaves mooring lines below relatively motionless, providing a “quiet” platform for hydrophones and other sensitive listening devices. 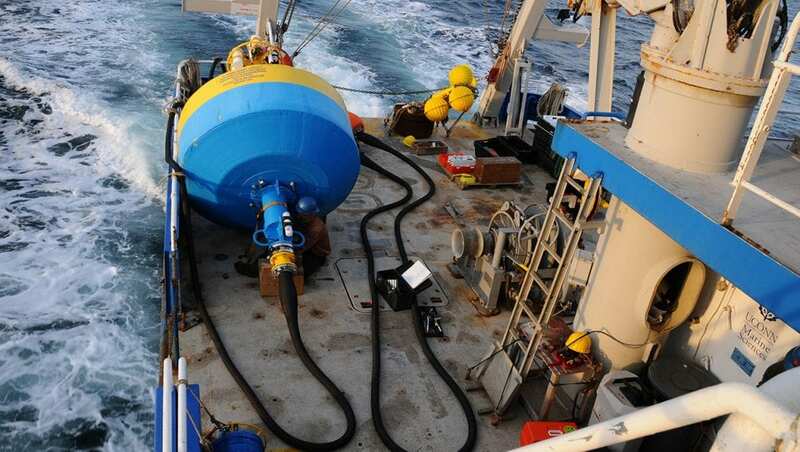 EOM stretch hose are being used in the newly launched Ocean Observatories Initiative, a $386 million project funded by National Science Foundation to establish long-term oceanographic platforms equipped with sensors that can monitor ocean conditions 24/7 for decades. They are also used on mooring networks to listen for endangered whale calls and transmit those signals to shore—in an effort to warn ships of the whales’ presence and avoid lethal collisions. The hoses’ power-handling capacity and fatigue-resistance also offer advantages for emerging offshore floating power-generation installations. EOM was created in 2010, with a $500,000 investment from WHOI, by a group of engineers and mooring operations technicians who developed the technology. EOM, based in Pocasset, Mass., has grown to ten employees. A recent appraisal commissioned by EOM Offshore concluded that the company had a fair market value as of December 2016 of approximately $2.8 million. WHOI sold its 68 percent ownership interest to EOM’s management team and investors for $1.8 million. “The sale of EOM Offshore to a new management team and investors is a great example of WHOI’s ability and success in creating new blue-tech companies, technologies, and jobs that benefit the local community, the state of Massachusetts’ tech corridor, and the American economy as whole,” said Christopher Land, vice president for legal affairs and general counsel at WHOI, who will be stepping down as chairman of the EOM board as part of the sale.